For PRJP, the community re-entry period starts upon release from jail or prison and extends beyond the first year following release. Over a decade of scholarly work demonstrates that PRJP are particularly vulnerable to post-release opioid-related overdose mortality [12, 13, 14, 15, 16, 17, 18, 19]. Drug overdose is the leading cause of death following release from the criminal justice system internationally; the majority of overdose deaths are opioid related [16, 18, 19, 20, 21]. A seminal study in the United States demonstrated that after controlling for demographic factors, individuals released from prison in Washington State had 129 times greater risk of drug overdose in the first 2 weeks post-release relative to the general population. The majority of these overdoses involved opioids [15, 16, 17]. Elevations in overdose risk have been consistent internationally, among diverse demographic groups, and whether release was from long-term prison or shorter jail stays . 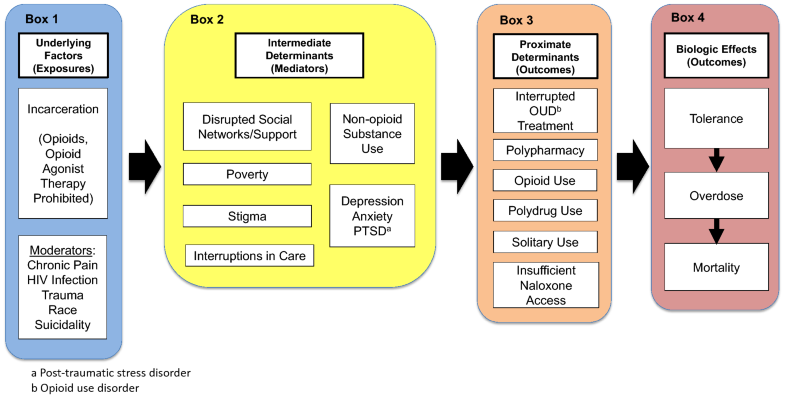 The intertwined epidemics of mass incarceration and opioid overdose create a complex risk environment where environmental, social, and biologic factors influence post-release opioid-related overdose mortality. Identifying factors that mediate and modify post-release opioid-related overdose mortality risk can create opportunities for novel interventions and programs. Previous reviews and theoretical models of opioid-related overdose have examined the biological determinants or mechanisms of overdose in the general population [22, 23, 24]. However, underlying environmental and social factors that contribute to post-release opioid-related overdose mortality in correctional populations are likely different and have not been systematically explored . 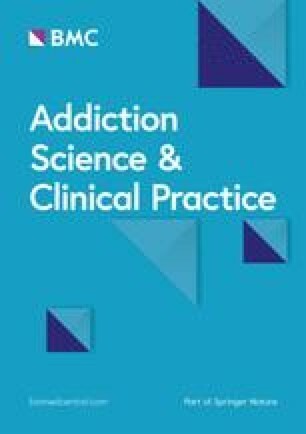 Given the potential number of factors, their interactions, and the need for institutional changes to address the risk environment, a common comprehensive model that explains post-release opioid-related overdose mortality is needed to direct intervention design and broad criminal justice reform efforts in this historically neglected population. After incarceration post-release interruptions in health care are common [77, 78, 79, 80]. Therefore, PRJP are less likely than the general population to have a primary care physician and more likely to use emergency departments or experience preventable hospital admissions [79, 81, 82]. Among a group of men released from jail or prison with chronic health conditions, barriers to accessing clinical care included lack of insurance, stigmatization, substance use, being on parole, institutional bureaucracy, and being assigned to the indigent system. These men reported reducing their utilization of the healthcare system due to these barriers . Reduced access to care has implications for screening to identify overdose risk and interruptions in access to medications for opioid use disorder (MOUD). More than 1 in 15 adults released from jail or prison were taking a prescription medication at the time of incarceration and 41.8% stopped taking these medications following incarceration . In addition, psychiatric medication regimens disrupted during incarceration and barriers to care after release hinder the continuity of mental health care . This may result in under-treatment of symptoms in some cases and over-sedation in other cases [86, 87, 88, 89]. Post-release changes in mental health treatment may lead to polypharmacy such as use of opioids with benzodiazepines, especially in the context of treating post-release anxiety disorders; polypharmacy use is a strong overdose risk factor [90, 91]. PRJP also have high prevalence of psychiatric disorders, including depression, anxiety and post-traumatic stress disorder, which may increase the risk of post-release opioid-related overdose . Estimates suggest 50–60% have a mental health disorder including 20–30% with symptoms of major depression [40, 94, 95], and between 40 and 50% exhibit both psychiatric and substance use disorders . High levels of psychiatric symptoms among PRJP may increase exposure to other risk factors for post-release opioid-related overdose including prescription opioids [97, 98], benzodiazepines , and alcohol [98, 100, 101, 102]. Among adults receiving long-term opioid therapy for chronic pain in the community, those with moderate and severe depression were 1.8 and 2.4 times more likely to report misuse of opioids for non-pain symptoms . Lack of MOUD availability during incarceration creates an interruption in care affecting the post-release period. MOUD includes opioid agonist therapy (OAT)—methadone and buprenorphine—and the opioid antagonist naltrexone. Together they are the mainstay of treatment for OUD and are broadly recommended by numerous professional organizations and guidelines [109, 110, 111, 112, 113]. Research demonstrates OAT reduces overdose and mortality risk [114, 115, 116]. Naltrexone can reduce the risk of post-release opioid relapse, but its effect on opioid-related overdose mortality among PRJP is less clear [117, 118, 119]. Despite strong consensus on the effectiveness of OAT, access to OAT among those involved with the justice system remains low, with many corrections systems prohibiting access to these potentially lifesaving medications [120, 121]. People receiving OAT in the community typically have their medication withdrawn during incarceration, and for those not enrolled in treatment, OAT are rarely started during incarceration or at the time of release . In 2014, only 4.6% of individuals within the criminal justice system, including community corrections, referred for treatment of OUD received either methadone or buprenorphine therapy compared to 40.9% of individuals referred outside of the criminal justice system . Access to OAT is particularly poor in jails where less than 1% of individuals needing methadone receive the therapy . While 55% of prison systems report offering methadone, over half of these only offer methadone to individuals who are pregnant or diagnosed with chronic pain . PRJP participating in community corrections programs may continue to face barriers to OAT. Many community corrections agents report little autonomy to refer individuals to OAT and some worry about the abuse potential of the medications . Data from England and Australia demonstrate that individuals with OUD who leave jail or prison receiving an effective dose of OAT are much less likely to die of an overdose than those who are not receiving treatment [126, 127]. Detailed interviews with PRJP also suggest that the experiences of opioid withdrawal during incarceration after OAT cessation may dissuade them from restarting OAT following release [128, 129, 130]. During community reentry, exposure to illicit substance use is common, often triggering opioid relapse, while enrolling in OUD treatment is hindered by other intermediate determinants, including health insurance termination, emotional or psychological distress, and competing priorities, such as securing housing or employment [61, 107, 131]. Therefore, incarceration can prevent MOUD access both during incarceration, as well as upon release due to negative experiences. Incarceration is also a missed opportunity to initiate OAT, which could increase treatment utilization post-release and potentially prevent opioid-related overdoses [132, 133, 134, 135].